It’s that time of year when all the adverts are even more pumped up with children’s toys or treats. Lucas is driving me crazy wanting everything that comes on TV, his favourite magazine at the moment is the Toys R Us Christmas catalogue and he tells us that’s he’s waiting for Christmas for pretty much everything in it. I have a feeling he’s going to be disappointed when everything doesn’t appear. I really thought this would start next year, not this year. I have already unwrapped his main present I had bought him because I’ve decided to push it back to a birthday present to accommodate one of the toys he hasn’t stopped talking about! 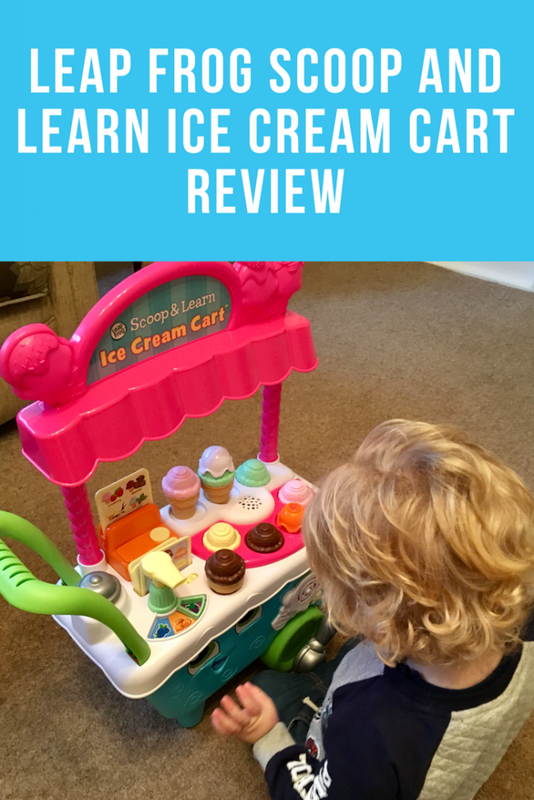 The other toy that he has been obsessed with is the Leap Frog Scoop and Learn Ice Cream Cart and thankfully Leap Frog came to my rescue with this as they offered to send one to Lucas to review, thank you Leap Frog! For those of you that haven’t seen this, it is an interactive ice cream cart where you can create imaginative ice cream combinations with various flavours and toppings. 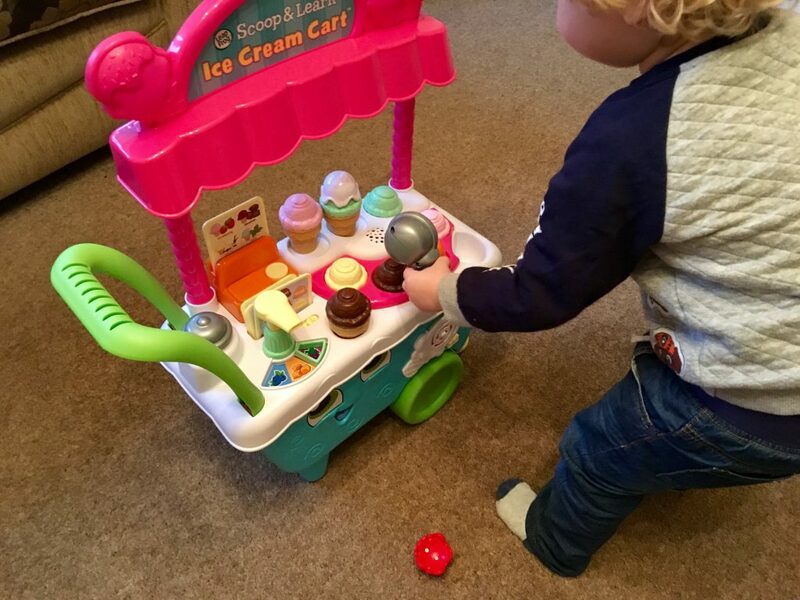 Lucas loves being a ice cream man, he will walk around the living room pressing the bell before asking us what flavour we would like and then whether we would like a cream topping and sauce. It is adorable and I think I love this cart as much as Lucas. It comes with a magic scoop to serve the ice cream and it recognises which flavours and toppings it is holding. The pump can be pressed down to pretend the sauce is coming out and it says which sauce it is, how many times it has been pushed etc. There are 6 cards that the cart recognises and depending on which card is slotted into the cash register, it will change the activity. It is a fab way of making learning fun, the various activities teach colours, numbers and tests memory. There are some very catchy songs and if you have had enough of listening to it, you can lower the volume as there are 2 volume choices. The cart also has 2 drawers at the sides to keep the ice creams and toppings in so they don’t get lost. This looks so cool! I’d have been all over that when I was younger! Bet it makes you guys feel a tiny bit hungry for ice cream though haha! My goodness, I would absolutely have loved this when I was little! I know my nephew would appreciate this for Christmas actually. It must be manic at this time of year with everything new coming out. 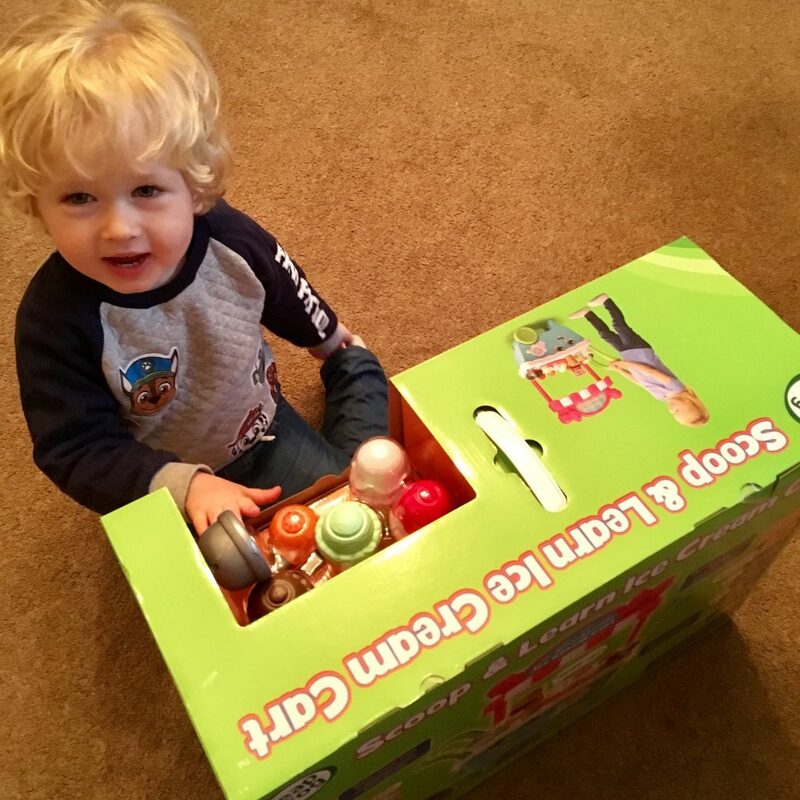 Glad you were able to get this for Lucas! Oh this looks fab! My kids are the same with the adverts, its relentless!! They’d love this one too no doubt! Oh my goodness how cute is that. I love toys that need a little imagination to be used as well. A very charming learning toy,Leap Frog is pretty popular here in the States as well. This is so cute and reminds me SO MUCH of the Stop me and buy one? Does anyone else remember it? I had one as a child and LOVED IT! This looks like such a fun toy, my daughter would of loved that when she was younger because she loves ice cream. This looks like such a fun toy. My daughter would have loved something like this when she was younger! Oh wow, Leap Frog certainly has evolved since my eldest (nearly 18 now!) got his first console way back when. This looks like a really fun station! This looks like so much fun, I love the imagination and innovation behind it. I know many kids that would love this! 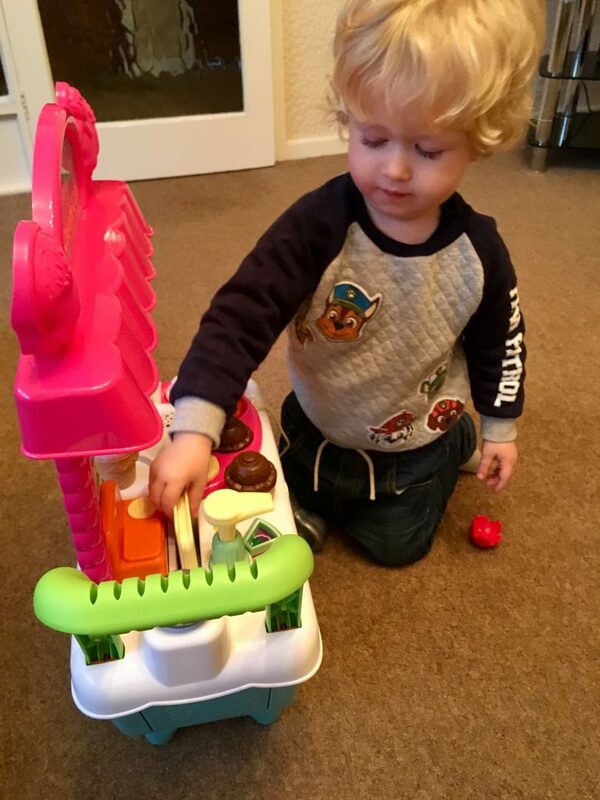 Leap Frog have some fantastic interactive toys, this looks like so much fun! Leap Frog are brilliant aren’t they? I haven’t seen this one before and it looks great, really colourful and fun!